Chianti. 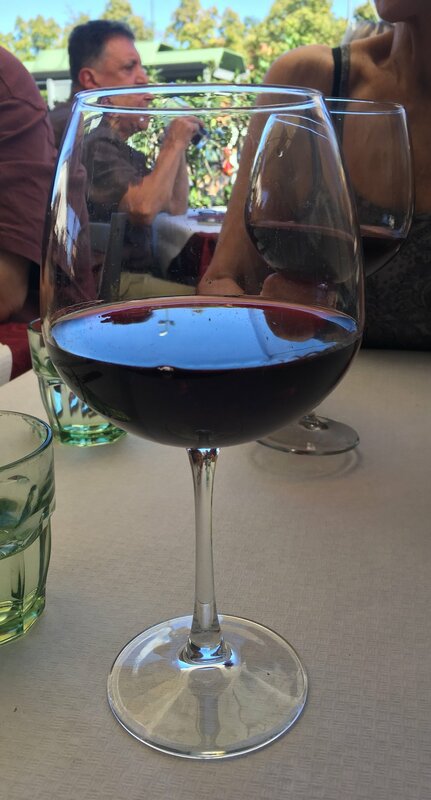 Ask someone to name an Italian wine and this is often the first wine they will think of. Chianti is a wonderful wine, a blend containing mostly Sangiovese grapes. Chianti is also the name of the region in southern Tuscany where the grapes are grown and the wine produced. The Chianti region stretches south from Firenze (Florence) toward Siena and includes some of the most beautiful landscapes in Italy. 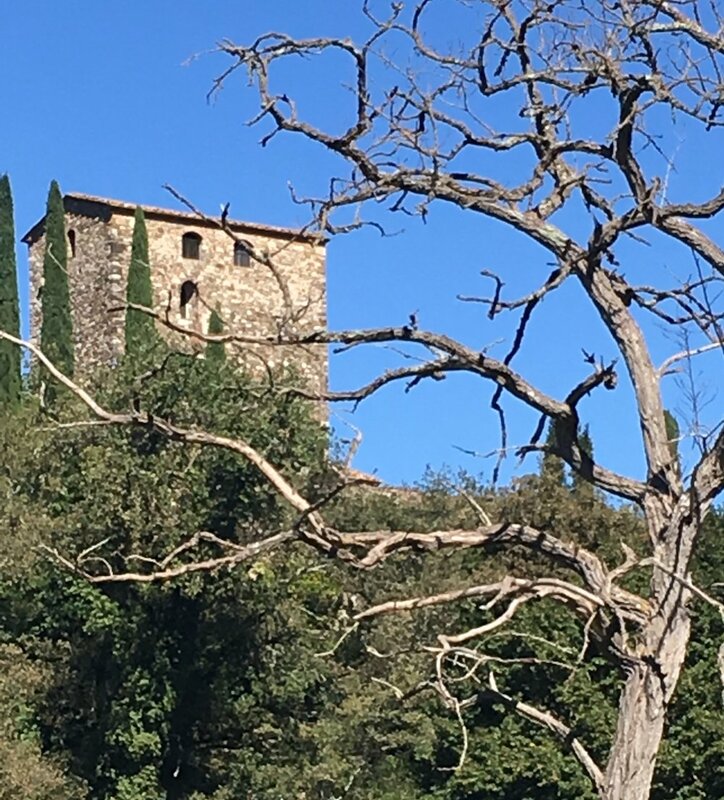 Exploring the Chianti region is best done by car, driving slowly along the narrow, winding roads and stopping whenever the road widens enough to pull over to enjoy the view and snap a few photos. I recently had the chance to do just that, spending a perfect autumn day driving the back roads of Chianti with a trio of friends. And since I wasn’t doing the driving (lucky for me!) I had plenty of opportunity to watch the passing scenery. And there was so much to see - vineyards, olive groves, stone villages, farmhouses. The hill crests provided spectacular wide views over the valleys, and the valleys provided views along creeks and wooded areas, of vines just beginning to wear their early fall color, and of entrances to gravel roads leading uphill to stone farmhouses. With our time limited to a day, we focused on visiting two of the many villages and towns in the region. 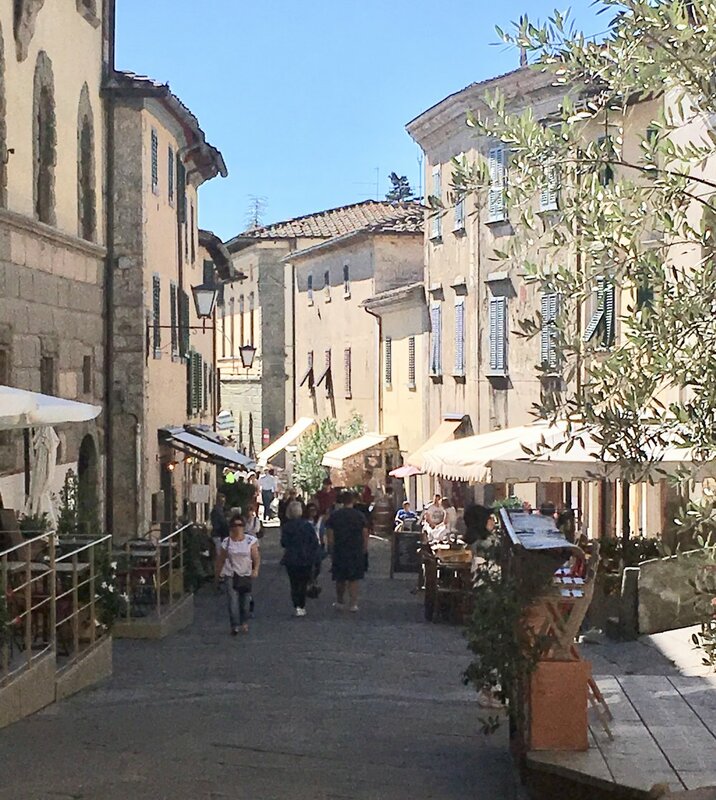 Our first stop was Castellina in Chianti, one of the three original Chianti villages (along with the villages of Gaiole and Radda, the only ones allowed to use the “Chianti Classico” appellation and the famous Gallo Nero or black rooster on the seal). After spending most of the morning in Castellina, we were off toward Greve. The road between these two towns offers more stunning landscapes and some good scenic view points with space to pull over, explore, and take photos. A most appealing spot was just around a bend in the road. It looked at first glance to be a stone farmhouse across from a smaller stone building with a sign saying molino nuovo (new mill), situated next to a small creek. A closer look revealed the “farmhouse” to be a beautiful B&B with a large terrace, pots of flowers, and a very peaceful vibe. I would love to book a future stay here at the B&B La Fiaba - it looks like the perfect place to spend a few days exploring this area. We arrived in Greve ready for lunch. We had done little advance planning for this day, preferring just to choose a restaurant by look (crowded with locals) and aroma. The restaurant La Cantina hit both of these and we happily waited for a table. It’s hard to mind a long wait when you are greeted warmly and with a complimentary glass of prosecco! The staff was great - friendly, fun, quick to laugh and the outdoor setting was pleasant and the food delicious. Placed on the table was a basket of a unique crisp flatbread (a change from the more commonly served basket of bread). It was baked in-house and there were stacks of this simple yet delicious bread piled on the counter inside the restaurant. Our shared appetizer was a mixed plate of crostini - slices of toasted bread, with pate, mushroom, melted gorgonzola, and tomato. Delicious! Between the four of us, we tried two pasta dishes - a pici with tomato, onion, and cinghiale along with a pacchetti (wide tubular pasta) with ricotta and pancetta. Very different flavors, but both were delicious. Also delicious was the wine, a Chianti Riserva (aged longer than other Chiantis, at least two years). Lunch finished with an apple cake topped with gelato and caffè macchiato. This was one of those classic two-hour Italian lunches full of good company, good conversation, and plans for future days exploring this region.